This is my version of Turning Twenty which is going to The Quilt: A Breast Cancer Project. 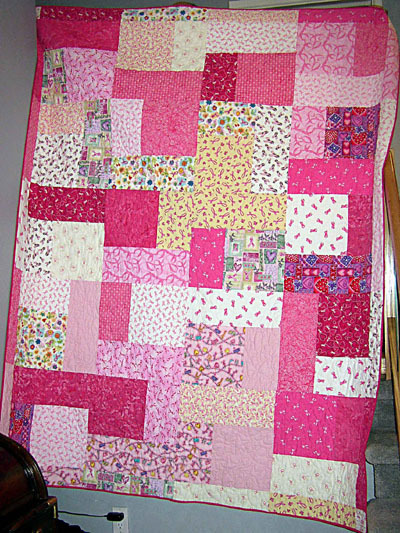 I named my quilt Twenty Pink Pleasures for the Cause. I wanted to incorporate different reasons in the naming; thus - twenty from your pattern, pink for breast cancer, pleasures as it certainly was mine to make this for the Cause. The corner block has meaninful words from a pink ribbon fabric. I fussy cut so that each corner had different sayings in it. I also attached a pin on the quilt that is for breast cancer.